As mentioned last week, BAKE Designs have just launched their Fall/Winter collection of T-shirts, complete with a limited edition, 1 of 1, black/infrared colourway of the Scroll T-shirt. 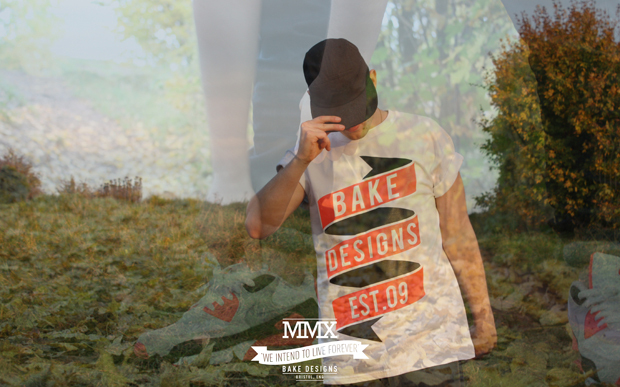 You can get your hands on this super limited T-shirt, produced for BAKE by Uno One Print & Design in Bristol, by entering the brand’s first ever competition. To win, all you have to do is take a photo of yourself in a pair of legendary Nike Air Max 90 Infrareds and upload it to the BAKE Designs facebook page. The best photo submitted wins. The competition closes on Friday December 3rd and the selected winner will be rewarded with 1 Air Max 90-inspired T-shirt (in size large) and few other surprise gifts. So, break out the infras, grab your camera and get snapping. Good luck to all those who enter, w’ll be keeping a close eye on the results! will they except a pic of me in my JLS boots? I’m gonna go ahead and say that’s unlikely. It’d be an interesting submission nonetheless.